Pt100 temperature transmitter / Pt1000 / 3-wire / Modbus - TxMini-M12-485 - Novus Automation Inc. 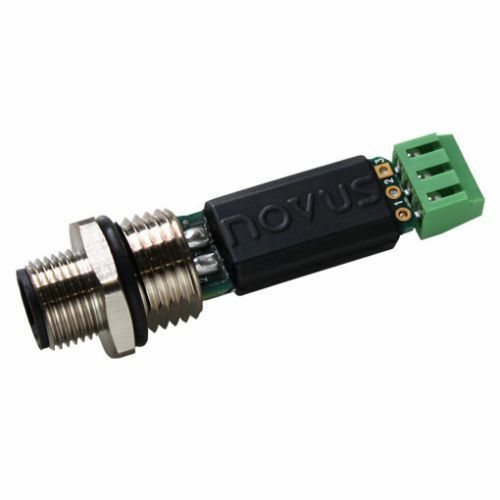 Detection - Measurement > Temperature and Humidity Measurements > Pt100 temperature transmitter > Novus Automation Inc. The TxMini temperature transmitters with serial communication have compact dimensions and M12 quick connector. Besides that is an outstanding solution for high resolution temperature measurement, it is also perfect to fit places with small available spaces. Because it features RS485 with Modbus-RTU protocol, the TxMini is easily integrated with your PLC or SCADA system. There are two ways to configure the TxMini. The first is installing the DigiConfig software. It’s free and can be downloaded on our website. The other way is sending Modbus commands directly to the controller. These commands are usually generated by a SCADA supervisory system.